Here at Pierate we have rated over 300 pies in the four years or so we have been sailing the 7 Cs. One of the challenges is trying to maintain some consistency with our pie reviews and ensure we are being fair to the producers. Of course it is impossible to be completely consistent as it is subjective as to what a great pie should taste like and we have a number of reviewers. It can also be difficult when trying to compare a pie to another one you may have eaten a year ago. To try and combat this I have here a Pie Head to Head. 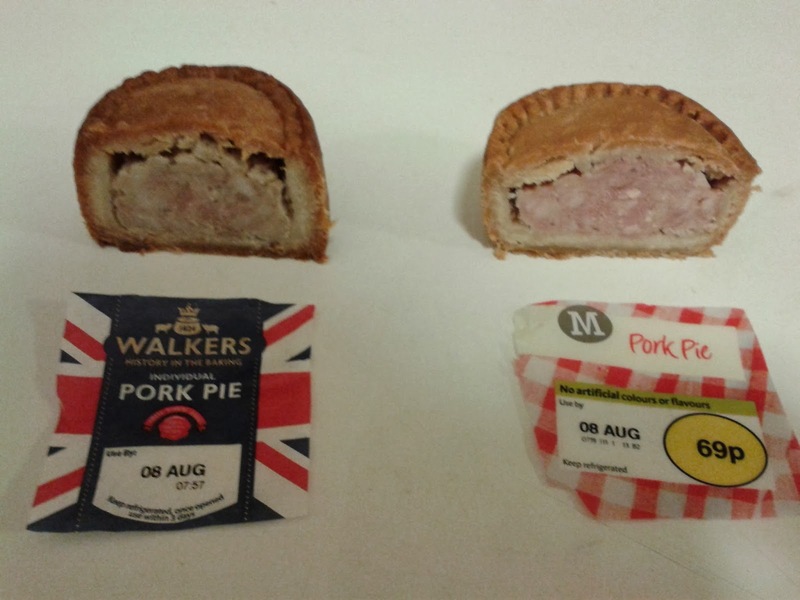 It will make it much easier to do a direct comparison of these two different brands of pork pie when eating them at the same time. We have in the red corner a Morrisons individual pork pie. In the blue corner a Walker & Son individual pork pie. The Morissons effort costs only 69p whereas the Walkers version was 89p. Would paying that extra 20p really mean I get a better pie? I often suspect that branded products are pretty much the same except for the packaging. Taking them out of the wrappers and cutting them in half quickly showed that this wasn’t the case. For a start they were different shapes with the Walkers pie having more height and less width. For me this gave it a better pastry to filling ratio that the Morrisons version. They both looked quite appealing with the Walkers having the darker brown colour as typical of pies from the Melton Mowbray region. The meat was also more of a grey colour in the Walkers pie whereas the Morissons version was more pink. Again, I believe the greyer meat is typical of a Melton Mowbray pork pie. I was somewhat confused as to why it didn't say that the Walkers pie was a Melton because they are one of the most well known Melton Mowbray pork pie producers and this certainly seemed like a Melton. 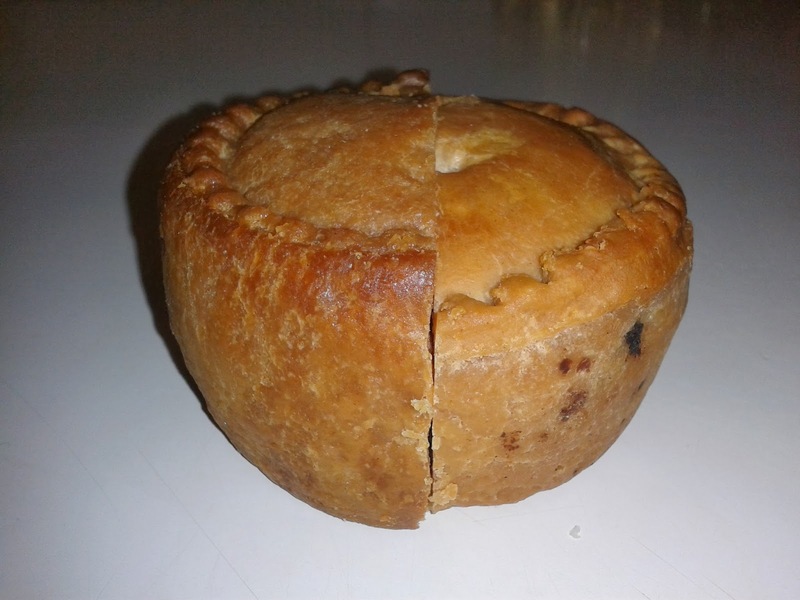 To find out more see our Melton Mowbray pork pie article. But appearances can be deceiving, the real test was in the eating! The Morrisons pie fared pretty well on the first bite, the pastry was great, it was soft inside and crunchy on the outside which gave it a nice texture. However, the pink meat was a bit too mushy, there was also a lack of jelly meaning it wasn’t really what I expected from a pork pie. To me it tasted more what I would expect the filling of a sausage roll to taste like. Having said that, the filling did still taste good and wasn’t at all chewy, I enjoyed eating the pie. I did find that there were some minor air gaps where I would have expected jelly to have been. I was pleased to find that the Walkers was much better. The pastry had an even better crunch while again being soft on the inside. The filling had a wonderful texture, being granula rather than mushy. It did feel more like eating chunks of meat. The seasoning also captured that classic pork pie taste whist not overpowering the meaty taste. The only downside was that there were some air gaps although most of the gaps were filled with jelly. Certainly a pie I would get again. In summary, it is interesting to see that in this case paying more really did make a difference. Whilst they were both good pies for the respective prices the Walkers pie is the one I would buy again if I could afford to. I think it was worth the difference.